Mid-nineteenth century Vienna reflected the turmoil that was unfolding throughout Europe during this era. Most significant for the residents of Vienna was the October Revolution in 1848, during which the troops of the Austrian Empire engaged in street-to- street battles with the workers and students fighting for a more democratic form of government. By the end of October, the imperial armies had not only bombarded the city of Vienna, but also executed all but one of the resistance leaders. The result was a reactionary authoritarian period in Austria that would last until World War I.
Rudolph Ernst was born into this dismal environment on February 14, 1854 to Eleonora and Leopold Ernst. He was fortunate that his father was a successful architect, who encouraged his son’s interest in the arts. The family home at Schmöllerlgasse 3 is one of the architect’s rare residential designs; his primary work was on St. Stephen’s Cathedral and other civic projects. As a child, Ernst must have enjoyed a comfortable life in this elegant home, with convenient access to nearby parks. At age fifteen, in 1869, Ernst’s father sent him to study at the Academy of Fine Arts, where he himself had studied architecture in the 1820s. His drawing teacher was August Eisenmenger (1830-1907), a portrait painter and specialist in mural painting who was well known for his ceiling panels at the Wiener Musikverein, one of the city’s most renowned concert halls. In 1873, Ernst also began studying under Anselm Feuerbach (1829-1880) at the Academy. Unlike Eisenmenger, Feuerbach had traveled extensively and had studied not only at the Düsseldorf Academy, but also with Gustav Wappers at the Royal Academy of Fine Arts in Antwerp. Although little known today, Wappers’ romantic style was influential on many of the next generation of painters, particularly Lawrence Alma-Taddema, and Ford Maddox Brown. Feuerbach also spent a number of years studying and working in Venice, Florence and Rome, moving to Vienna only in 1873 when he received a position as professor of history painting at the Academy. By that time, Ernst was entering his fourth year at the Academy; his studies with Feuerbach most likely introduced him to the possibilities of the wider artistic world, including not only Italy but also Paris, where Feuerbach had studied with Thomas Couture from 1851-1853. Ernst left the Academy in 1874 to study the old masters in Rome, perhaps at the suggestion of Feuerbach. Two years later, he moved to Paris. Both of Ernst’s parents had died during his years at the Academy, which must have made his decision to leave Austria fairly straightforward. Again, Feuerbach may have had an influence on this decision, perhaps having shared stories of his own experience in Paris with his students. And 1876 was certainly a propitious year for a young artist to arrive in a city that was fast becoming the center of avant-garde art. Once in Paris, Ernst began using the French version of his name, shifting from Rudolph to Rodolphe. He settled quite quickly at the rue Humboldt, 25 in Montparnasse; he would remain there until he moved to Fontenay-aux-Roses early in the twentieth century. This location was both his home and his studio. Losing no time in establishing his career, Ernst made his Salon debut in 1877. Initially he exhibited genre scenes and portraits, as in 1879 when he submitted two paintings, Venus in exile and Portrait of M. [i] In 1880, he traveled to the Finistère region of Brittany to paint, exhibiting Lavoirs à Concarneau (Finistère) (Washhouses in Concarneau) in 1881. [ii] Throughout these early years in Paris, Ernst was exposed to everything from Impressionism to mainstream academic painting and a variety of earlier styles from the Barbizon painters to Realists. His Salon submissions suggest that he tried his hand a several different types of subject matter. What caught his attention, though, was the Orientalist painting depicting the imagined life of the Arab world. In 1885, Ernst traveled first to Spain and then on to Morocco and Tunis. There he was able to sketch and photograph the daily life of the residents. These images would later be transformed into detailed canvases, full of exotic interiors and costumes. The trip to Spain and North Africa marked a significant turning point for the artist; he redirected his work to focus exclusively on Orientalist imagery. At some point after 1878, Ernst met his life-long friend Ludwig Deutsch (1855-1935), a fellow Austrian and artist who had also been raised in Vienna. Deutsch arrived in Paris in 1878 to study with Leopold Carl Müller (1834-1892), a genre painter specializing in peasant scenes from Hungary, Italy and North Africa. 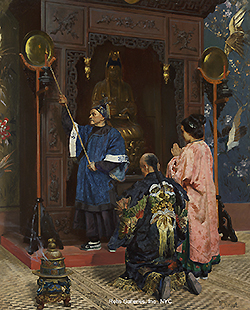 How or when Deutsch and Ernst met remains unknown, but it is likely that their shared interest in Orientalist painting was their initial common bond. The two men remained close until Ernst’s death in 1932. 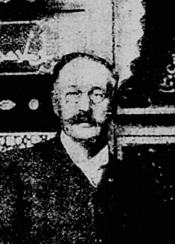 In 1890, Ernst and Deutsch made a trip to Turkey and Egypt. They visited both Constantinople and Cairo, recording what they saw with photographs and, in Cairo through the purchase of photographs from local studios. Ernst also collected quite a number of objects that he sent back to Paris; these would later become the props and backgrounds of his paintings. Many of them are used repeatedly in a variety of different canvases. By the end of the century, Ernst added yet another medium to his repertoire. In the introduction to an exhibition catalogue, L. Roger Milès writes: “Today, the painter returns to one of the sources of inspiration that aroused his curiosity at the beginning of his career; he has recalled the beautiful decorations that he executed for Monsieurs Koenigswarter, maréchal Mac-Mahon and the duke de Castries and he has arrived at new, brilliant, superb, original work not as a painter, but as a ceramist.” [v] Ernst’s ceramics were indeed a mixture of many different genre scenes. Included in his faience pieces were not only the expected Orientalist images, but also figures from the theatrical tradition of the commedia dell’arte as well as the Renaissance. Eventually, he branched out into the production of tiles as well, inspired by the Islamic tiles he had seen on his trips to the Middle East. Shortly after initiating his career as a ceramist, Ernst moved a few miles southeast of Paris to the village of Fontenay-aux-Roses, probably around 1900. He decorated his new home, at rue du Plessis-Piquet, 15 bis, with the exotic objects he had purchased on his trips as well as his own “Ottoman” style faience tiles. In addition, he set up a shop to produce the faience tiles for sale to the public. Ernst also continued to paint, producing at least twenty large Orientalist canvases during the next decade, and exhibiting many of them at the Salon. During these years, he decided to become a French citizen, perhaps in response to the increasing political tensions between the Austro-Hungarian Empire and France. Ultimately, this proved to be a prescient decision; as a citizen, Ernst could remain in France during World War I while his friend Deutsch had to leave because he was still an Austrian citizen. The war years were grim, and there was a decided drop in art sales. Things improved after the Treaty of Versailles was finalized in 1919, and Ernst was again showing his work at the Salon in 1920. His friend Deutsch had returned to France by then and become a French citizen himself; he soon signed his paintings as Louis rather than Ludwig. Ernst worked at his various forms of art throughout the 1920s, occasionally visiting his old haunts in Montparnasse. As one of the first artists to understand the advantages of living in the left bank neighborhood, he must have smiled at the plethora of young artists, musicians and writers flooding into the area in the 20s. Rodolphe Ernst died at home in Fontenay-aux-Roses in 1932 at age seventy-eight. [i] Société des artistes français, Explication des ouvrages de peinture et dessins, sculpture, architecture et gravures et lithographie, Nos. 1166 and 1167 (Paris: Charles de Mourgues Frères, 1881) 96. [ii] Société des artistes français, Explication des ouvrages de peinture et dessins, sculpture, architecture et gravures et lithographie, No. 847 (Paris: Charles de Mourgues Frères, 1881) 78. [v] L. Roger-Milès, Catalogue des oeuvres de Rodolphe Ernst, faiences décoratives, aquarelles (Paris: Maulde, Doumenc & Cie., 1898) 4.